Anna Fitzpatrick Layer earned her bachelor’s degree in history with a Bible minor from Cedarville University. In the fall of 2016, she completed her master’s degree in history with a concentration in public history from Villanova University. Anna’s primary research interests include Irish participation in the American Civil War, along with more general Civil War history. She also finds the American Revolution and World Wars I and II fascinating! Various travel and work opportunities have enhanced Anna’s love of history and teaching. During the summer of 2015, Anna had the opportunity of traveling to Ireland with other Villanova students to participate in a summer studio program with Ireland’s national theatre, the Abbey Theatre. While in Ireland, Anna enjoyed exploring how Ireland’s history is portrayed through its theatre. Various internships at national and local historic sites and museums, such as the National Archives, deepened Anna’s passion for sharing history by giving tours to groups of students and the general public. Anna has also worked as a TA for online Cedarville University politics courses. She greatly enjoyed working with the students in this position, and helping them achieve their academic goals. 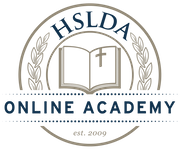 Anna is so excited to teach again with HSLDA Online Academy and to share her passion for history with her students! She looks forward to meeting her students, and conveying to them how history enriches lives, creates empathy, and reveals more of God’s sovereignty. Anna currently lives in Texas with her husband Jacob and their Beagle / Jack Russell mix, Tammy. Along with spending time with her husband and family, Anna enjoys going on walks and hikes, playing the piano and harp, baking, reading, knitting, and touring museums and battlefields. Anna has been teaching with the Academy since 2017.